Ideal for machine vision, quality control, web & surface inspection and line scan applications, these compact and robust optics offer low distortion, uniform performance across the focal plane and an image circle of 43.2mm. Offered in several optimized model variants for short working distances and Infinity. These lockable optics feature a wide range coating of 400 to 1000nm for use in the visible and infrared spectrums. 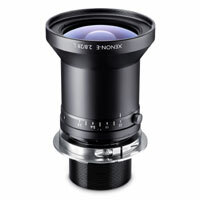 These lenses are also available as either a Canon or an V mount.